In 2008, First Presbyterian marked another milestone in its ministry, celebrating "175 Years of God's Enduring Faithfulness" and looking forward with anticipation to what God has in store for the future. Like a lot of downtown, mainline Protestant churches, First Presbyterian enjoyed something of a heyday during the middle decades of the twentieth century, as new housing developments sprang up and parents brought baby boomer offspring to church. During the remarkable 32-year pastorate of Rev. J. R. Walter (1927-1959), scouting was re-introduced, a new education building was constructed (in 1949), and the first religious education director was hired. 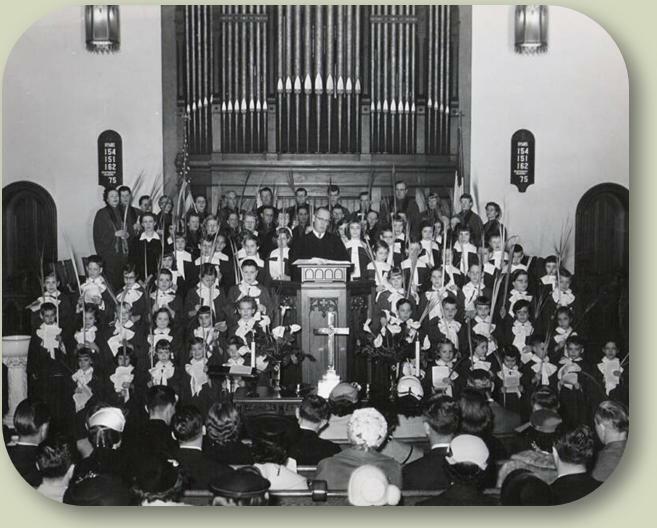 With a new pipe organ and four choirs (one for adults and three for youth), music ministries were flourishing as well. In the decades since, the church has confronted the challenges associated with operating in a different ministry environment. It has never been as numerically strong as it was at its peak in the late 1950's. 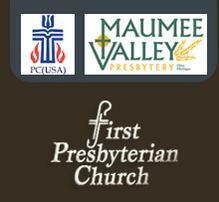 But in the face of changing circumstances, the members of First Presbyterian have sought to remain faithful to the mission God has called them to in the heart of the city and to discover new opportunites for service. Ministries of spiritual renewal have blessed the congregation with fresh life and energy. And as changing economic conditions have left many of our neighbors struggling, the church has taken the lead in helping to establish ministries like Care and Share, Liberty Center, and the Bethesda Care Home. His faithfulness endures through all generations." The post-Civil War era brought a fresh wave of prosperity to the newly-renamed City of Fremont, as industrial development got underway and stately Victorian homes started appearing along the city's tree-lined boulevards. Under the steady leadership of Rev. Ebenezer Bushnell (who served 1857-1882), the Presbyterian Church was poised to become an important institution in the religious life of the city. 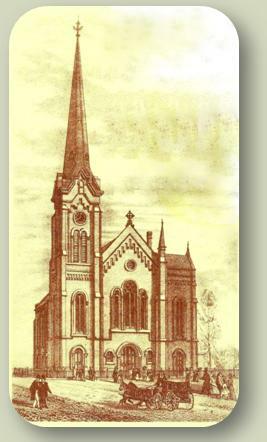 Symbolizing this growing role, in 1869 the Presbyterians laid the cornerstone for a magnificent, new Romanesque-style edifice on the site of their former house of worship. Costing nearly three quarters of a million dollars (in inflation-adjusted currency), it was dedicated debt-free four years later and became the city's first tall-steepled downtown church. An extensive remodelling in 1893-94 gave the sanctuary much of it's present-day appearance, including the addition of the existing stained-glass windows. Throughout the nineteenth century, spiritual revivals--often following on the heels of periods of concerted prayer--did much to swell the ranks of the church and bring renewed vitality. First Presbyterian was also at the forefront of a host of causes associated with this era, including the Protestant missionary movement, the campaign for temperance and the Young People's Society for Christian Endeavor (the first trans-denominational evangelical student organization). In order to evangelize the city's growing population, Sunday Schools, with their own separate chapels, were established in Ballville Township, in the Prairie neighborhood, and on Fremont's East Side (the origins of today's East Side Presbyterian Church). The site that is now Fremont was still a Native American village when the Presbyterian Church's Western Missionary Society sent the Rev. Joseph Badger there at the turn of the nineteenth century to establish a mission to the Wyandot tribe. In later decades, as white settlers flocked to the area, the village of Lower Sandusky (modern-day Fremont) grew up around the lower rapids of the Sandusky iver and became the county seat. 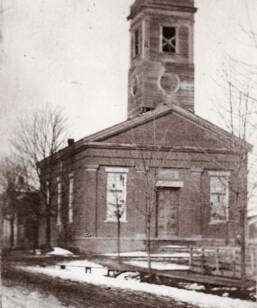 There, on November 30, 1833, a group of 22 townspeople met at the courthouse to establish a Presbyterian church. The fledgling congregat ion met for a while in various locations, including the school house, a commercial building on Front Street, and a house on the east side of the river. In 1844, the congregation finally found a permanent home with the acquisition of property at the corner of wat is now Park Avenue and Garrison Streets. Three years later, the first house of worship was erected on this site.